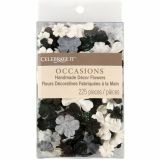 Celebrate It Handmade Paper Flower Confetti 225/Pkg - PRIMA FLOWERS-Celebrate It: Handmade Paper Flowers. All Prima flowers are always handmade making them an excellent addition to your own projects and designs. Each paper flower is beautiful in its own right but can also be combined and layered to create a dazzling bloom! They are also great for sprinkling across tabletops for extra decoration during special occasions. This package contains an assortment of various flower styles ranging in size from approximately 5/8 to 1 inch in diameter, 225 flowers total. Available in several colors: each sold separately. Imported.